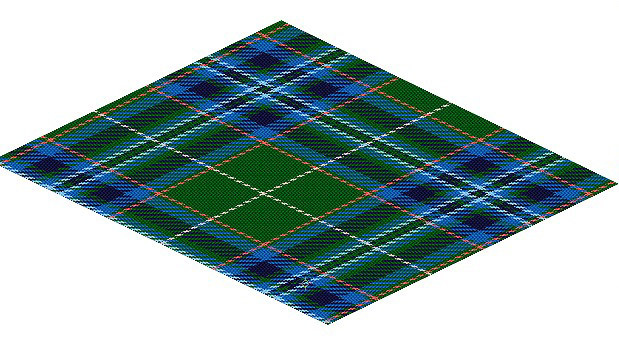 I was delighted recently to be asked to design a tartan for that fascinating little Isle of Eriskay. Despite its tiny size (2.5 x 1.5 miles) it punches well above its weight in the unique selling point ring. For a start this was the first Scottish footfall for the celebrated Bonnie Prince Charlie when he returned in 1745 to signal the second Jaocbite rebellion. For a second it was where – in wartime Britain of 1941 – the SS Politician ran agound with a part cargo of 28,000 cases of malt whisky bound for Jamaica and New Orleans – a Scotsman’s idea of having died and gone to heavan! That incident was the inspiration for the famous Whisky Galore film. Next in the USP stake is the Eriskay Love Lilt, a haunting and hugely popular traditional song from the Western Isles. Then comes the island’s own historic breed – the Eriskay pony. Following on is the Eriskay jersey, a traditional seamless garment knitted for the island’s fishermen. Finally . . . we have the Pink Sea Bindweed. Not native to the Hebridean islands, its seeds are said to have fallen from the Bonnie Prince’s handkerchief when he pulled it out to stem the snivels from his first encounter with Scottish weather. So, if you’re lucky enough to ever visit Eriskay, remember to buy something in their unique tartan – it’ll be a great help to the economy of that tiny island community of around 140 souls. Don’t touch the glass of single malt that’s sitting behind the Politician bar waiting for me to visit! An excellent well written piece on our lovely Island , I’m hoping this is another bit of history /legacy being made with the introduction of our very own Tartan. Thank you Neil. It was an honour to be associated with that fabulous little isle. I’m hoping that glass of malt behind the Politician’s bar hasn’t turned into the Angels’ Share before I get to it.